The country now called Myanmar, was known for most of its history as Burma. A trip to Burma is a trip back in time, and I am not using hyperbole, the country has only recently opened to the west, Coca-Cola has only been sold here since 2013. 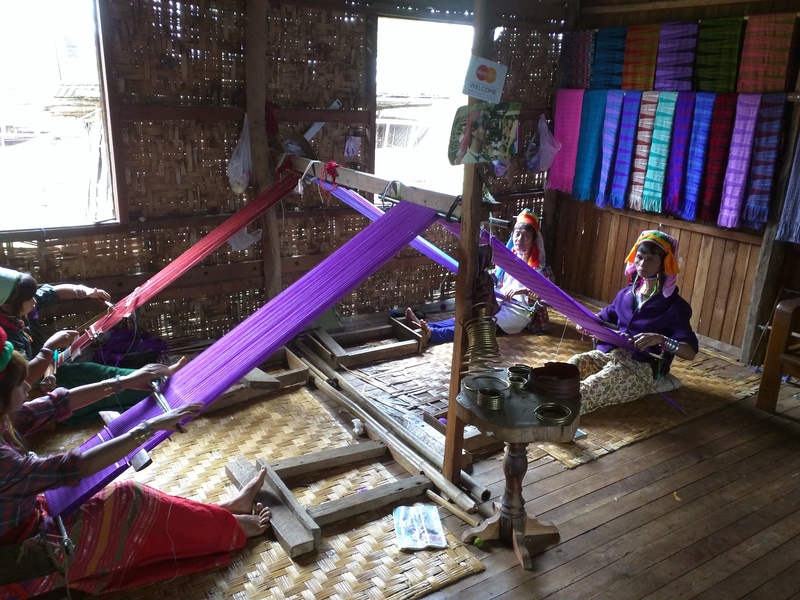 Although rich with natural resources, oil, gems and Teak forests, Burma is the 23rd poorest country in the world, and only ahead of Afghanistan and Nepal in Asia by GDP per person. North Korea is ahead of them. Old meets new, checkout this guy’s phone situation. Our 6 day trip to Burma began in the largest city Yangon. Newly opening up to foreign investment, Yangon was one big construction site. Traffic in the city is miserable, was almost missed our night bus after a 5 mile drive took us 2 hours. Besides the construction and the traffic, Yangon, does have one of the most important Buddhist sites in the world. 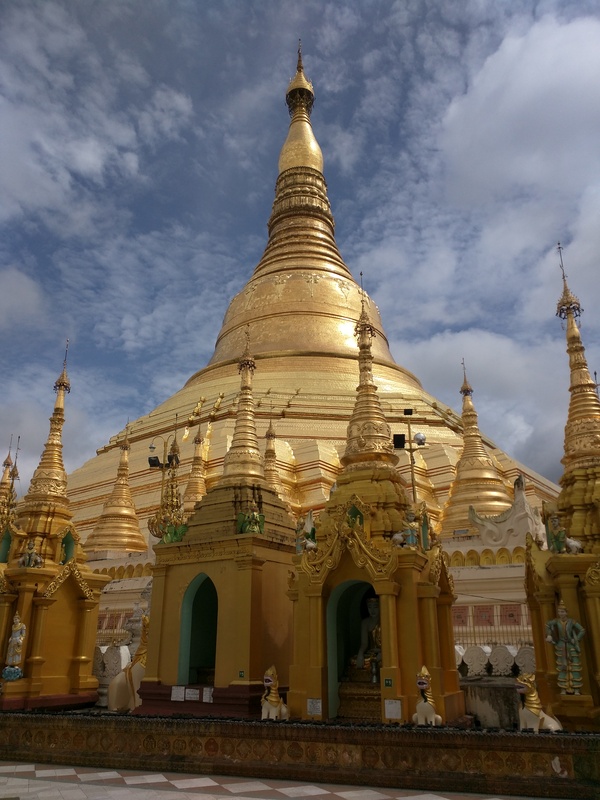 Shwedagon Pagoda is massive at 325 ft. tall and covered in gold. The top crown is topped with 5,448 diamonds and 2,317 rubies and gems, including a 75 carat diamond! After a day in Yangon, we hoped on a night bus to Bagan. Bagan is an ancient city, whose heyday was about 800 years. Bagan, is an amazing place to visit, the city and the surrounding countryside have over 3,000 of these pagodas. 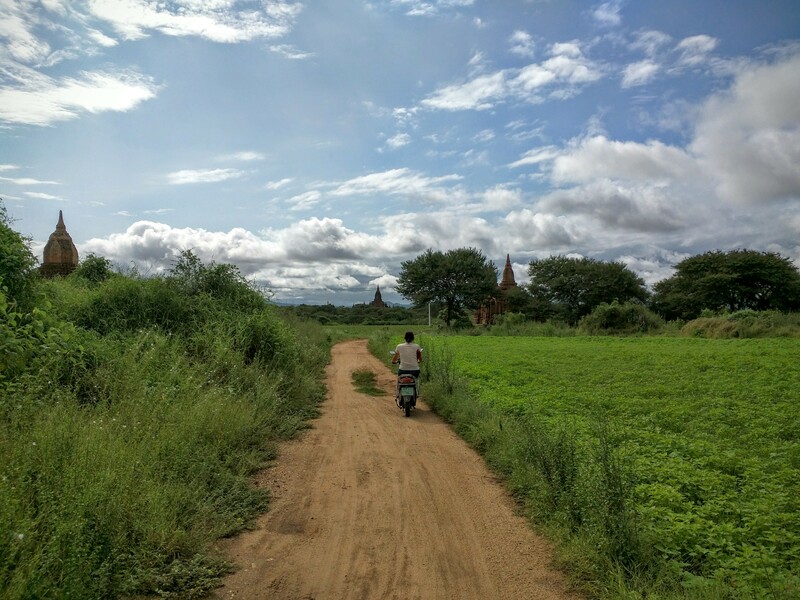 Being one of the biggest tourist draws in Burma, Bagan was surprisingly low key. Tourism still hasn’t taken off in Burma, it was a nice change of pace from the frenzied pace of many of our recent trips. 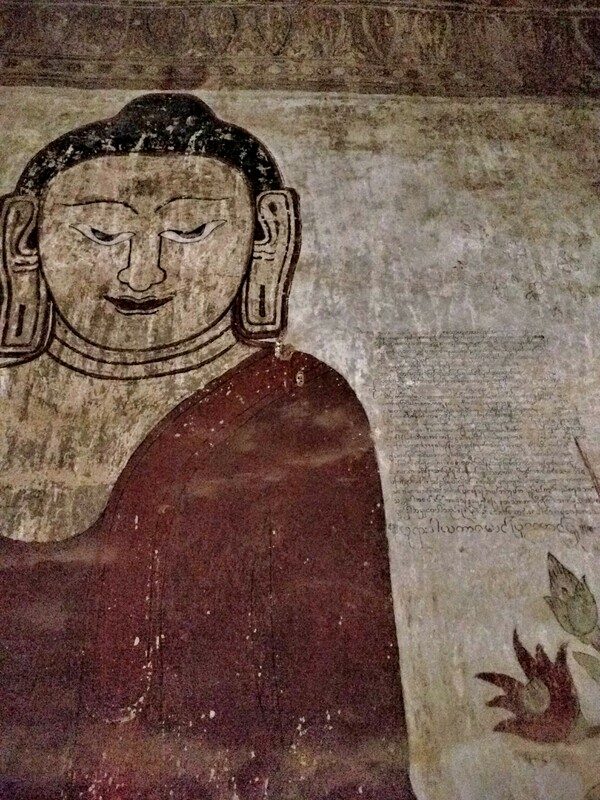 Painting on the inside of one of the biggest temples. We really enjoyed Bagan, to see the sights, you can either rent a horse drawn cart for the day $5.50 including driver or an electric scooter for $4. We opted for the scooter and spent our days driving the countryside being blown away by the sheer volume of temples here. 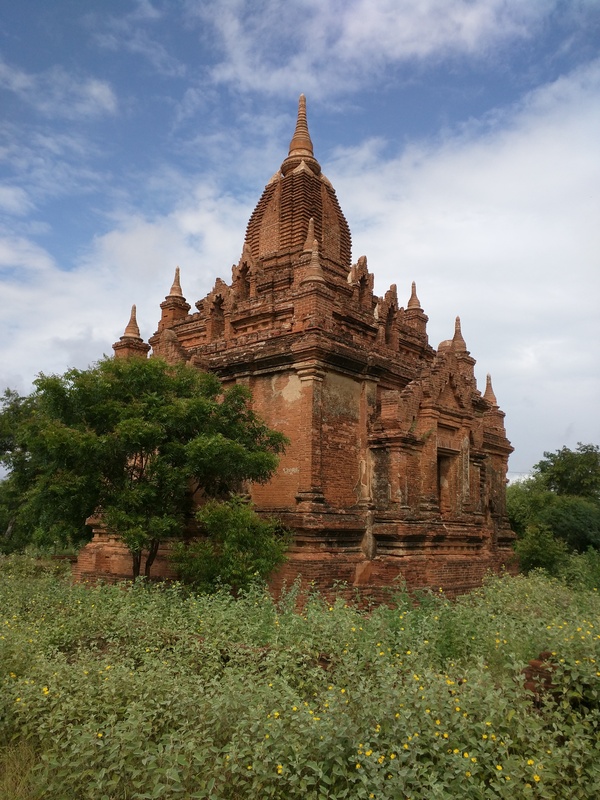 Leaving Bagan, we hopped on a plane, our destination was a mountain village of Kalaw. Being a closed country, tourists are only allowed to visit around 20% of Burma. 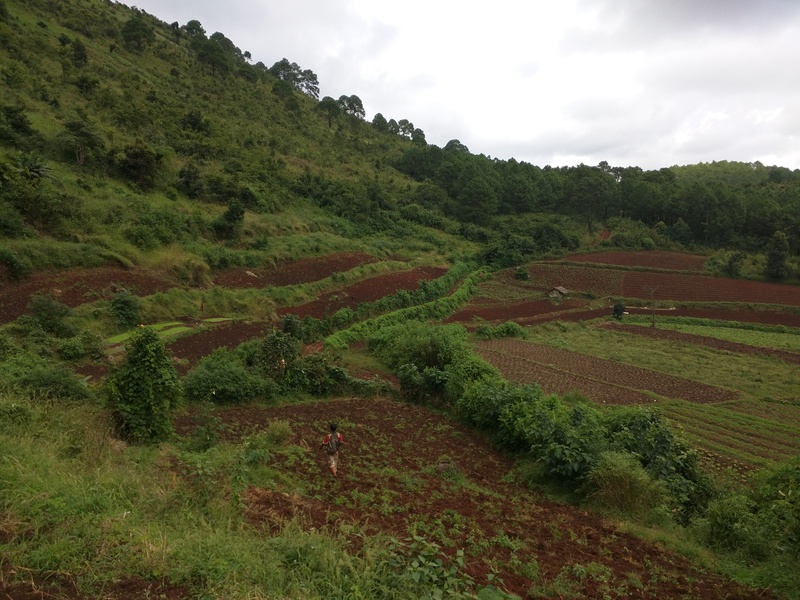 Kalaw is one of the few place outside of cities, we could go. We headed there to relax, enjoy the cool mountain air and hike. 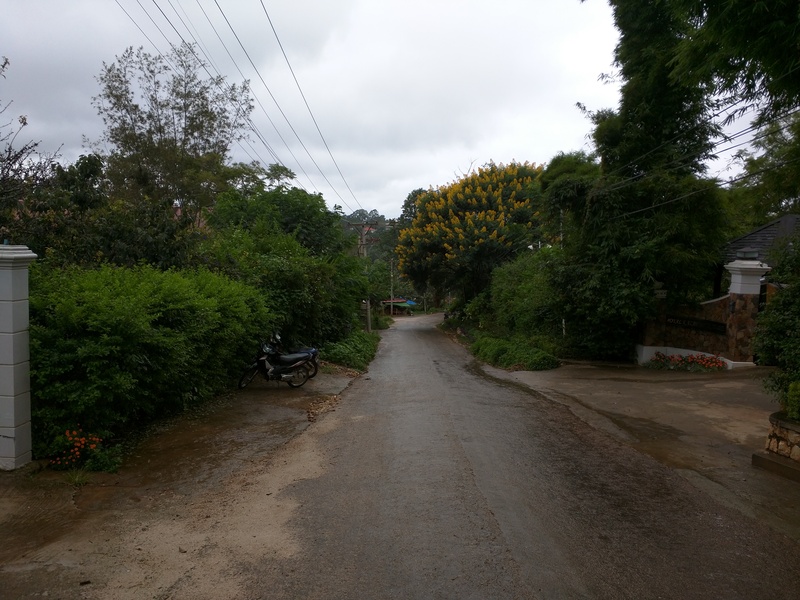 The main road in Kalaw. This huge tree was in full bloom. It rained for most of our time in Kalaw. So one day, we opted to rent a car and driver and drive to Inle Lake. 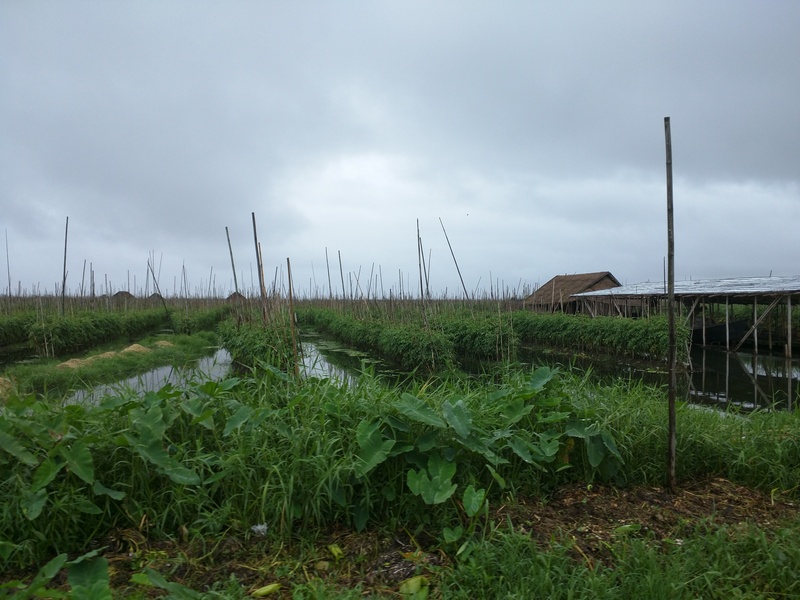 A great decision, Inle is massive and home to thousands of people who live exclusively on the water. Homes, schools and even massive garden beds are all built over the lake. Floating garden beds grow, lettuce, cabbage, tomatoes and peppers. Hiring a boat and driver, they take you around the lake, visiting different villages that all specialize in crafts from silversmithing, to cigar rolling, lacquer wear and yes even a weaving village with long-necked women! 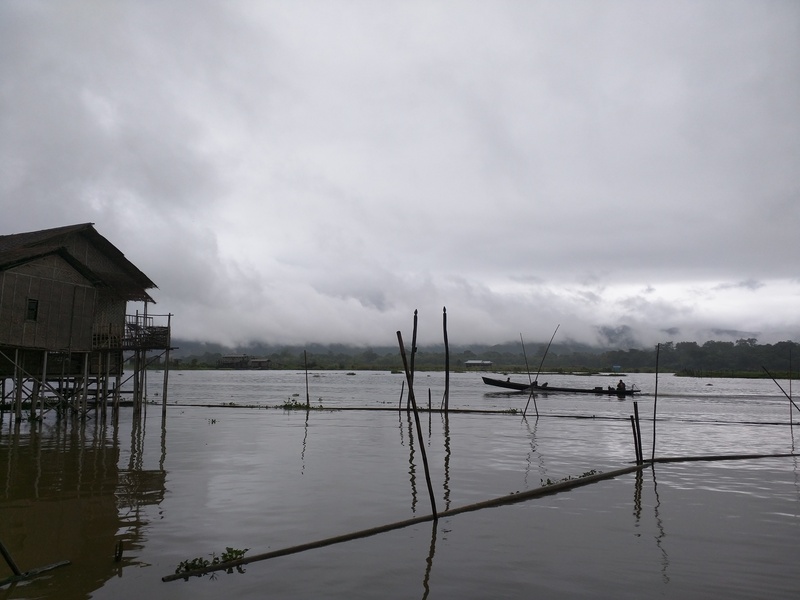 It rained, this day as well, making picture taking difficult, but still you could feel why Inle is considered a sacred place by the local people. Without a doubt, one of the single best experiences we’ve had our whole trip happened unexpectedly one night in Kalaw. Lonely Planet, had recommended visiting HI, the only bar in town for a rum punch. What a treat. The bar didn’t have a sound system, instead patrons took turns on the guitar, playing Burmese songs which would inevitably end with everyone in the bar singing along. People in the bar were so nice, with everyone crowding down to our end, asking us questions through the 2 guys who were translating the conversation. It’s rare to get to have a “real” cultural exchange, and are very lucky we had one of those moments this night. Yep, this is the whole bar. 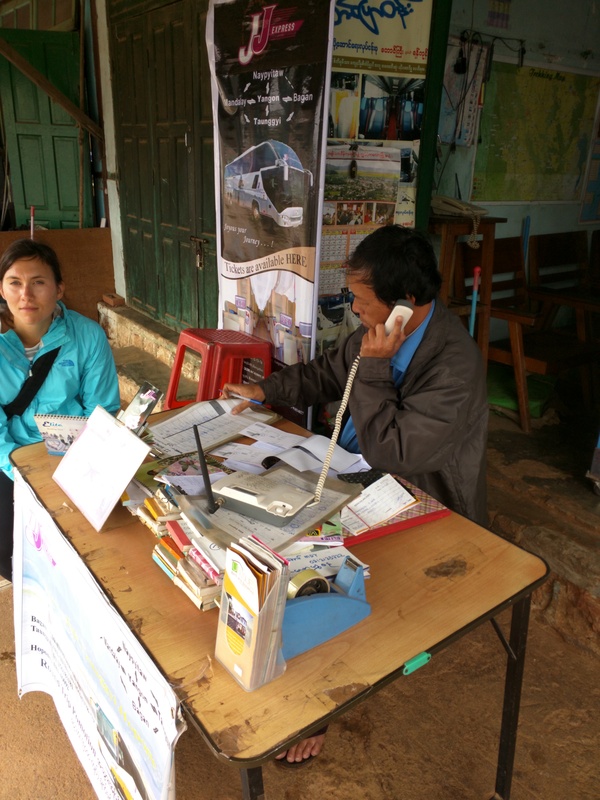 Ask us later about the hike we took our last day in Kalaw. This was one of the few pictures we took before finding ourselves stuck hiking through a mud bog. It was not one of the finer moments of our trip so far. A local farmer walked us thourgh his carrot beds walking us around a mud bog. RIght before we realized what we were in for. 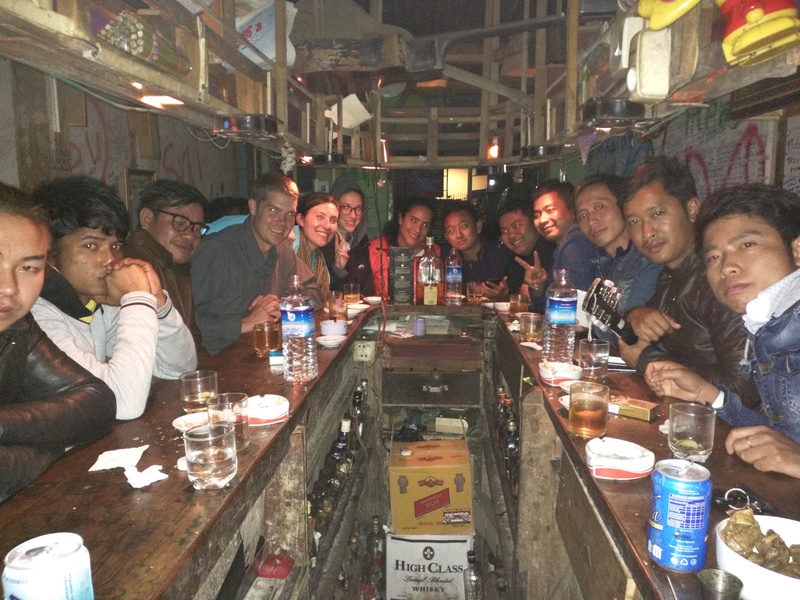 That night, with wet and muddy clothes in hand, we hopped on another night bus for a frightening 10 hour drive through the mountains back to Yangon. I am not kidding, halfway through this crazy taxi bus ride, Kristin and I were so scared, we said goodbye to each other in case we died. They have their own time zone, which runs on a half hour, they are an hour and a half behind Singapore. Trying to break with their British ruled past, one day 30 years ago, they switched which side of the road they drive on, from the left (British) to the right (American). Almost none of the cars have been replaced since the switch, so most cars are British style drive on the right. Meaning a driver has to pull all the way into oncoming traffic before he can see if a car is coming. The largest city Rangoon, was changed to Yangon. Everyone he talked too still calls it Rangoon. In 2006, the capital was moved from Rangoon to Naypyidaw (read more about it) which was basically a dirt field before being named the capital. Driving past one site, Kristin noticed all of the construction workers in plain view wore western style outfits, hard hats and boots. Behind a covered fence, we could clearly see laborers in shorts and flip-flops. As with most authoritarian countries we’ve visited, appearances are more important than realities in Burma. The ATM only dispenses 5,000 Kyat ($4 US) notes. With limited ATM’s and no credit cards, you should see the stack of bills you get when you pull out the max about $300 US. Most food in Burma is pre-cooked and since refrigeration is limited, it sits out until it’s ordered. This goes against our biggest food no-no while traveling. There really isn’t any other options here, making every meal a potential time-bomb for intestinal issues. Skip the cold curries, and visit Everest, a Nepalese restaurant in Kalaw.